Hōryū-ji (法隆寺, lit. Temple of the Flourishing Law) is a Buddhist temple in Ikaruga, Nara Prefecture, Japan. Its full name is Hōryū Gakumonji (法隆学問寺), or Learning Temple of the Flourishing Law, reflecting that the site serves as a seminary as well as a monastery. 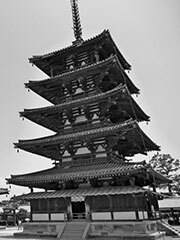 The temple is widely acknowledged to have some of the oldest wooden buildings existing in the world. The temple was originally set up in 607 on Prince Shotoku’s instructions, and at the time it was called «Ikaruga-dera»(斑鳩寺).In 670 it was burned down, but gradually re-built until early 8th century. Later, it became a major religious center for Hossō Buddhism. There is evidence that Paekche craftsmen and artisans provided the technical expertise to help build the Hōryū-ji. . There is the precedent of Paekche artisans building the first Japanese Buddhist temple, Hōkō-ji(Asuka-dera, end of 6C).